Caution is advised when responding to requests for sensitive information via email as phishing scams still pose a serious threat. 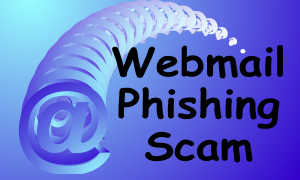 Despite the fact that the original reports on this phishing scam go back to December 2012, the Web Solutions team would like to warn customers that this or similar scam operations may be still ongoing worldwide. “Phishing”refers to a situation in which a scammer is pretending to be a trustworthy institution requesting sensitive information (such as passwords, credit card details, user names, etc.) via electronic means which can later be used to gain unauthorised access to personal accounts. Please be aware that Web Solutions will never request any sensitive information (log-in name, password, etc.) to be sent back to us using plain text via e-mail. Customers contacting us by phone may be asked to send a confirmation e-mail as protective measures. This message is from webmail Support and we are sending it to every Email User Owner for safety. we are having congestion's due to the anonymous registration of web mail accounts so we are shutting down some webmail accounts and your account was among those to be deleted. We are sending you this email so that you can verify and let us know if you still want to use this account. If you are still interested, please confirm your account by filling the space below. Warning!!! Account owner that refuses to update his/her account after 48 Hours of receiving this warning will lose his or her account permanently.